Fine furniture and creative interior design ideas can result in a beautiful and functional home office. There is so much choice when it comes to designing the look and feel of your work space. Come and be inspired by the imaginative displays at our high-end furniture store. We have unique pieces from all over the world and our knowledgeable and friendly staff will be happy to show you around. Designing a home office doesn’t have to be complicated or too much work. With the right furniture, tasteful accessories and a fresh coat of paint, you can design to impress. The decorating experts at our furniture store share simple ideas that will give your decorating spirit a boost. Simply chic: Small spaces can be just as impressive as sprawling ones, provided you choose the right type of furniture. At Carrocel, we have a range of unique office desk designs with customization options to suit diverse tastes and spatial requirements. Choose a desk with character and pair it with a stylish chair from our collection. Our luxurious Louis XV Writing Desk and are ideal choices for a simple but chic home office. World-class: If you have the luxury of space, our high-end office collection offers endless design possibilities. Pick from our exquisite pieces sourced from around the globe. Consider mixing modern with traditional to break the monotony. Select our Custom Floating Mid-Century Executive Desk which combines both modern and classic elements. 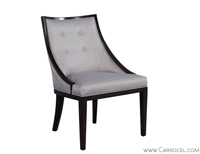 Complement it with one of our elegant office chairs. Add our EJ Victor Bookshelves to anchor your design. Their transitional yet complementary flavour blends with any décor. 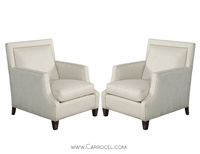 Treat your visitors to the luxury of our Charlas Custom Lounge Chairs or chic Custom Javier Accent Chair. Homely feel, yet professional: Aesthetics, comfort and functionality define the professional look for a home office. We have an entire range to help create your own distinct style. Our Custom Made Walnut Art Deco Office Desk is made with gorgeously figured walnut veneers and offers neat shelves for storage. 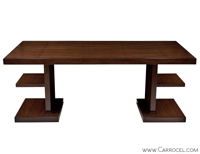 Fully customizable in different sizes and finishes, it has a timeless appeal that you will love. 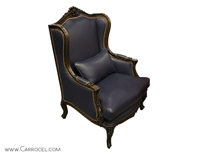 Pair it with our Carved Louis XV Styled Leather Wing Chair or Carved Library Office Wing chair to add a touch of elegance. 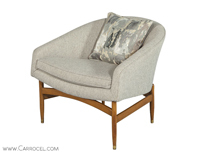 If space is not an issue, then a classy, Mid-Century, Modern Arm Chair will make a nice addition to your home office. Wall colour, lighting and accessories have a big impact on the final look. 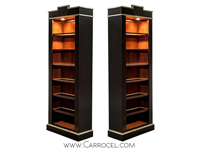 Come to the Carrocel furniture store for unique pieces and ideas to dress up your home office. 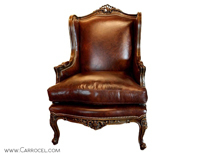 For over 30 years, homeowners have relied on our fine furniture to dress up their homes. Our clients are not just from Toronto but around the world. Quality and skilled workmanship sets our collections apart. Our staff delivers exceptional customer service and is always willing to answer any questions or help with furniture selection for your home. 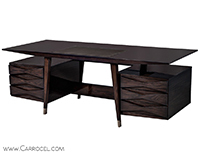 To check out our latest home office furniture collection, visit the Carrocel furniture store today. Call us at 416-999-2525 or contact us online to arrange a free consultation.